Contact | Can-Am Truck Export Ltd.
Can-Am Truck Export Limited in Delisle, Saskatchewan! We are a family-owned business and have been operating since 1992 specializing in all areas of heavy duty truck parts, diesel and gas engines, and a great selection of used trucks and equipment (cranes, trailers, etc.). Ask us about our huge selection of Heavy Truck Parts. We are wrecking more than 100 heavy duty trucks and have all makes and models of diesel engines, transmissions and differentials. We are happy to serve the province of Saskatchewan, customers from outside our provincial borders and Export markets around the world. 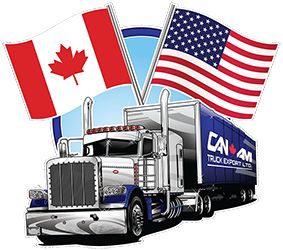 Customer satisfaction is our number one priority and we are confident that when you purchase equipment from CAN-AM TRUCK EXPORT we will meet and exceed your expectations. We also offer a 90-day warranty on many of our major trucks and parts. Please ask us for details. We have a great selection of heavy trucks arriving daily so be sure to check back often! We have a huge selection of truck parts and more arriving every day. Contact us for any heavy truck part requirements. We also have a very large selection of generators to choose from as well as Hiab Cranes to choose from. They're worth checking out! Click on our inventory for further details. Come by and check out our current inventory and speak to one of our staff about the equipment you are looking for. You can also request more information about a vehicle using our online form or by calling (888) 635-1172 or (306) 493-2222. If you'd like to see a vehicle in person, click on Location: To see a map of where we are located or give us a call for directions.